Structure your app with inversion of control (IoC) in mind. This getting started guide walks you through these steps for a simple console application. Once you have the basics down, you can check out the rest of the wiki for more advanced usage and integration information for WCF, ASP.NET, and other application types. The idea behind inversion of control is that, rather than tie the classes in your application together and let classes “new up” their dependencies, you switch it around so dependencies are instead passed in during class construction. Martin Fowler has an excellent article explaining dependency injection/inversion of control if you want more on that. For our sample app, we’ll define a class that writes the current date out. However, we don’t want it tied to the Console because we want to be able to test the class later or use it in a place where the console isn’t available. We’ll also go as far as allowing the mechanism writing the date to be abstracted, so if we want to, later, swap in a version that writes tomorrow’s date, it’ll be a snap. 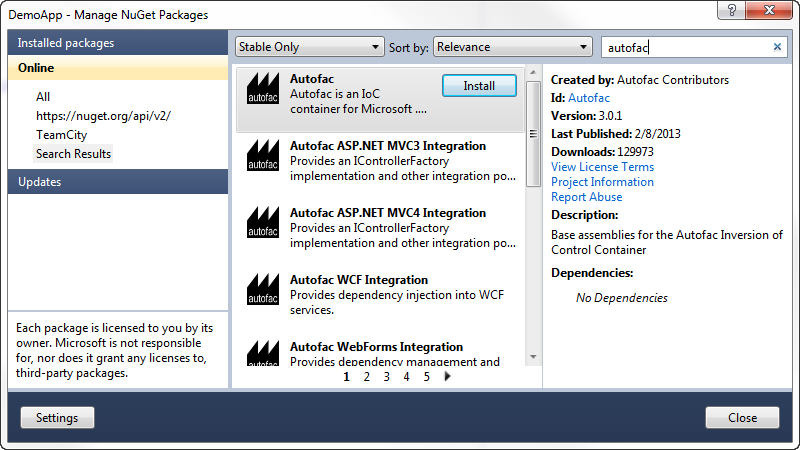 Now that we have a reasonably structured (if contrived) set of dependencies, let’s get Autofac in the mix! The first step is to add Autofac references to your project. For this example, we’re only using core Autofac. Other application types may use additional Autofac integration libraries.. The easiest way to do this is through NuGet. The “Autofac” package has all the core functionality you’ll need. At application startup, you need to create a ContainerBuilder and register your components with it. A component is an expression, .NET type, or other bit of code that exposes one or more services and can take in other dependencies. In this case, the component is SomeType and the services it exposes are SomeType and IService. For our sample app, we need to register all of our components (classes) and expose their services (interfaces) so things can get wired up nicely. Now we have a container with all of the components registered and they’re exposing the proper services. Let’s make use of it. During application execution, you’ll need to make use of the components you registered. You do this by resolving them from a lifetime scope. The container itself is a lifetime scope, and you can technically just resolve things right from the container. It is not recommended to resolve from the container directly, however. When you resolve a component, depending on the instance scope you define, a new instance of the object gets created. (Resolving a component is roughly equivalent to calling “new” to instantiate a class. That’s really, really oversimplifying it, but from an analogy perspective it’s fine.) Some components may need to be disposed (like they implement IDisposable) - Autofac can handle disposing those components for you when the lifetime scope is disposed. However, the container lives for the lifetime of your application. If you resolve a lot of stuff directly from the container, you may end up with a lot of things hanging around waiting to be disposed. That’s not good (and you may see a “memory leak” doing that). Instead, create a child lifetime scope from the container and resolve from that. When you’re done resolving components, dispose of the child scope and everything gets cleaned up for you. For our sample app, we’ll implement the “WriteDate” method to get the writer from a scope and dispose of the scope when we’re done. The WriteDate method creates a lifetime scope from which it can resolve dependencies. It does this to avoid any memory leaks - if IDateWriter or its dependencies are disposable, they will be automatcially disposed when the scope is disposed. Autofac sees that IDateWriter maps to TodayWriter so starts creating a TodayWriter. Autofac sees that IOutput maps to ConsoleOutput so creates a new ConsoleOutput instance. Autofac uses the new ConsoleOutput instance to finish constructing the TodayWriter. Autofac returns the fully-constructed TodayWriter for WriteDate to consume. The call to writer.WriteDate() goes to the brand new TodayWriter.WriteDate() since that’s what was resolved. The Autofac lifetime scope is disposed. Any disposable items that were resolved from that lifetime scope are also disposed. Later, if you want your application to write a different date, you could implement a different IDateWriter and then change the registration at app startup. You don’t have to change any other classes. Yay, inversion of control! Note: generally speaking, service location is largely considered an anti-pattern (see article). That is, manually creating scopes everywhere and sprinkling use of the container through your code is not necessarily the best way to go. Using the Autofac integration libraries you usually won’t have to do what we did in the sample app above. Instead, things get resolved from a central, “top level” location in the application and manual resolution is rare. Of course, how you design your app is up to you. The sample app gives you an idea of how to use Autofac, but there’s a lot more you can do. Check out the list of integration libraries to see how to integrate Autofac with your application. Learn about the ways to register components that add flexibility. Learn about Autofac configuration options that allow you to better manage your component registrations. You can ask questions on StackOverflow. You can participate in the Autofac Google Group. There’s an introductory Autofac tutorial on CodeProject. We have advanced debugging tips if you want to dive deep. The source code along with Visual Studio project files is available on GitHub. Build instructions and details on contributing can be found in the Contributor Guide.